-See Mobilization4MumiaFB, BringMumiaHome.com, freemumia.com, &/or FaceBook for most updated info. Also See YouTube Update from May 2015 (please share this video). Also iacenter.org. Join with us to help raise funds for Ramona’s healthcare! 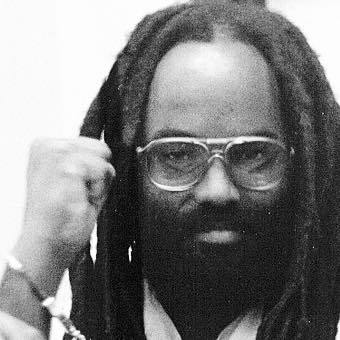 In a court case that could eventually lead to Mumia Abu-Jamal’s freedom, Judge Leon Tucker has ordered the District Attorney’s office to present new testimony in reference to Ronald Castille. Let the Judge and DA know you care by packing the court hearing on Monday, April 30 for the former Philadelphia Black Panther Party activist. Castille is a former PA Supreme Court judge who refused to disqualify himself when Mumia’s case came before the court despite having been the Philadelphia District Attorney during Mumia’s prior appeals. The US Supreme Court has ruled such conduct unconstitutional. The people’s movement forced the courts to take Abu-Jamal off death row in 2011 but his freedom was not won. Despite his innocence he was re-sentenced to life in prison without possibility of parole. As an innocent man, Mumia must be freed! It is even more urgent that he gain his freedom because he is suffering from cirrhosis of the liver, severe itching and other ailments. -Call DA Larry Krasner at (215)686-8000. ….Tell him to release all DA & police files on Mumia to the public. ….Tell the DA to release Mumia because he’s factually innocent. – Pack the court on 4/30. 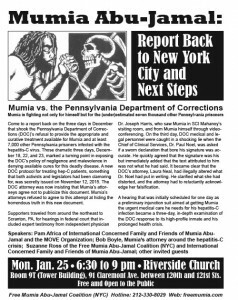 **Jan 17, 2018: Pack the Courthouse for Mumia. FB Event. Castille was a Philadelphia DA. Later as a PA Supreme Court judge, he refused to disqualify himself when Mumia’s case came before the court despite having been the DA during Mumia’s prior appeals. The US Supreme Court has ruled such conduct unconstitutional. The people’s movement forced the courts to take Abu-Jamal off death row in 2011 but his freedom was not won. **Sept 21, 2017: Judge backpedals on obtaining evidence which could clear Mumia. **Plan now for Dec 8 Teach In & Dec 9 Mass March. Stop the District Attorney’s Cover-Up! Stop the Frame-Up of Mumia Abu-Jamal! -3) Join a mass March and Rally on Friday, July 8, 2017: NOON outside the DA’s office (3 South Penn Square), across from City Hall. FB Event. If the people organize, the current legal struggle could win Mumia his freedom! ***FLASH: We did IT! On Jan 3, 2017, Federal Judge Robert Mariani ordered the Pennsylvania Department of Corrections to immediately give Mumia Abu-Jamal the life-saving latest direct-acting antiviral medications that have a 95% cure rate! After a year and a half of determined legal struggle, near death hospitalization, agonizing chronic sickness, and the efforts of thousands of activists, this ruling will impact prisoners throughout Penn. Winning a preliminary injunction is a tall order and requires proving there will be irreversible harm in delaying the order. This is a tremendous victory. It will pave the way for all incarcerated people who seek hepatitis C treatment. This may be the first case in the country in which a federal court has ordered prison officials to provide an incarcerated patient with the new medical treatment. **Mumia Abu-Jamal and many thousands of prisoners in Pennsylvania have Hepatitis C, a potential fatal virus. 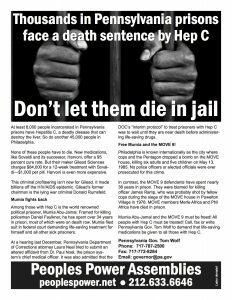 The state of PA is denying Mumia and 6,000 others access to the available, life-saving Hep-C cure. **Don’t miss: June 14, 2016: Report back from US Solidarity delegation to 19th Anniv. Celebration of RUE MUMIA-ABU JAMAL in Saint-Denis, France- 6:30 pm; Local 1199, 310 W 43rd St.
-PRECEDED by Solidarity Picket with French strikers, students, union members & undocumented workers: 4-6 pm French Consulate, 934 Fifth Ave, NYC. –April 30, 2016: Saint-Denis celebrates 10th anniversary of Rue Mumia Abu-Jamal. This is exciting! Mumia is fighting not only for himself but for the (under)estimated 7,000 other Pennsylvania prisoners. 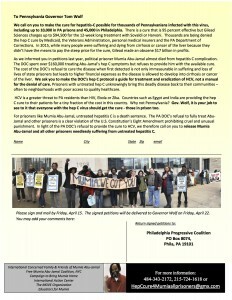 Come to a report back on the three days in December that shook the Pennsylvania Department of Corrections (DOC)’s refusal to provide the appropriate and curative treatment available for Mumia and at least 7,000 other Pennsylvania prisoners infected with the hepatitis-C virus. Those dramatic three days, December 18, 22, and 23, marked a turning point in exposing the DOC’s policy of negligence and malevolence in denying available cures for this deadly disease. A new DOC protocol for treating hep-C patients, something that both activists and legislators had been clamoring for, was secretly issued on November 12, 2015. The DOC attorney was now insisting that Mumia’s attorneys agree not to publicize this document. Mumia’s attorneys refused to agree to this attempt at hiding the horrendous truth in this new document. Supporters traveled from around the northeast to Scranton, PA, for hearings in federal court that included expert testimony from independent physician Dr. Joseph Harris, who saw Mumia in SCI Mahanoy’s visiting room, and from Mumia himself through videoconferencing. On the third day, DOC medical and legal personnel were caught in a shocking lie when the Chief of Clinical Services, Dr. Paul Noel, was asked if a sworn declaration that bore his signature was accurate. He quickly agreed that the signature was his but immediately added that the text attributed to him was not what he had said. It became clear that the DOC’s attorney, Laura Neal, had illegally altered what Dr. Noel had put in writing. He clarified what she had distorted, and the attorney had to reluctantly acknowledge her falsification. A hearing that was initially scheduled for one day as a preliminary injunction suit aimed at getting Mumia the urgent medical care he needs for his hepatitis-C infection became a three-day, in-depth examination of the DOC response to its high-profile inmate and his prolonged health crisis. CRITICAL COURT HEARING FOR MUMIA ABU-JAMAL IN SCRANTON, PA (Getting Mumia the New Hepatitis-C Medication) See the Youtube. We have a rare, one-time opportunity to get Mumia the medical attention he desperately needs. Please join us in and outside of the court in Scranton, PA on Friday, December 18. A bus and caravans are leaving from New York and Philadelphia. For info/rides click here. Our attorneys and the attorneys of Department of Corrections will present arguments. Our attorneys will argue that Mumia has the right to immediate life-saving treatment for his chronic and active Hepatitis C. The other side will insist that treatment be withheld until the final stages of the condition. In other words, until it’s too late to save him. 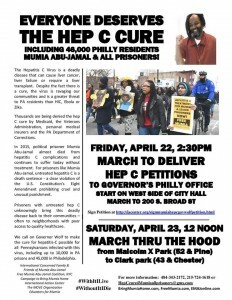 A legal victory in Mumia’s case will also be a victory for the other 10,000 PA prisoners afflicted by Hep C who have filed a class action suit. 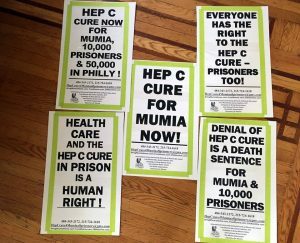 We want to pack the courtroom to support the demand for Mumia and 10,000 other Pennsylvania prisoners infected with hep-C to get the new drug which has shown a greater than 90% cure rate. ***Pass a Resolution to Save the Life of Mumia Abu-Jamal from ”Medical Neglect.” See sample from NYC May 1 Coalition. Also NWU (National Writers Union). ***FLASH: Sept 8-16, 2015: Mumia health update & legal fight. Click here &/or here. 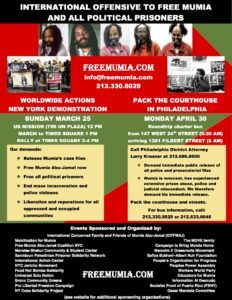 -May 19: Mumia was back in hospital but is out. See most current updates. 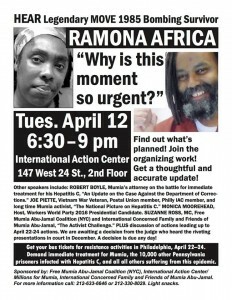 – May 17, 2015 – Calls Again Needed to Save Mumia’s Life! 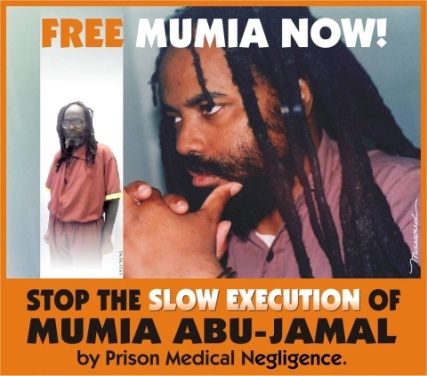 -Stop the attempted murder of Mumia through medical neglect! -Keep the pressure on!- Mumia’s Condition Grave Take Action NOW! On Friday, April 24, Mumia Abu-Jamal was visited by his spouse, Wadiya Jamal, who reported that his condition has worsened.She saw him again today and he appears even more gravely ill. Everyone is asked to call the prison and the Pennsylvania Department of Corrections immediately. If they hang up, call again. Please continue to call on Sunday, Monday and throughout the coming week… (continued here). For the complete info including call-in numbers & email, please go to millions4mumia.org. 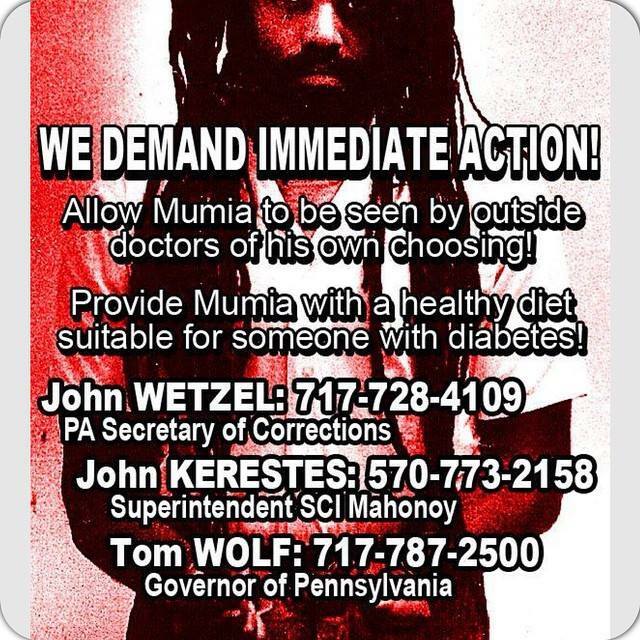 -Beginning at 9am: (570) 773-2158 x 8102: Flood The Phone lines of John Kerestes, Superintendent of SCI Mahonoy and demand that Mumia be allowed to see an outside doctor and get the complete adequate medical care he needs immediately. –Sat, April 24, 2015: New York City -Free Mumia Demo. Click image to enlarge for details. *SAVE THE LIFE OF MUMIA ABU-JAMAL! *STOP HIS EXECUTION BY MEDICAL NEGLECT! *DON’T LET THE STATE MURDER ANOTHER BLACK LEADER! *SHUT IT DOWN FOR MUMIA! ***Key dates/actions. Scroll down for more specifics, videos of actions, demands, background of situation. See also FergusonResponseNetwork. –MONDAY, APRIL 6: National Call-in Day: No medical execution of Mumia! See below for Call-in info. Continue all week. –TUESDAY, APRIL 7: Press conference in Philadelphia at 11 a.m. outside District Attorney Seth Williams’ office at Juniper Street & South Penn Square (across from City Hall, near Macy’s). –FRIDAY, APRIL 10: Organize a demonstration in your city, on your campus, wherever you can get out word to stop this attempt to murder Mumia. We need to SHUT IT DOWN FOR MUMIA! –Twitter widely using the hashtags #mumiamustlive, #saveMumia and #Blacklivesmatter. Stopped from carrying out the death penalty against Mumia Abu-Jamal by a worldwide movement that spanned three decades, the Pennsylvania Department of Corrections has been attempting over the past three months to execute him by medical neglect. On March 30, Abu-Jamal was rushed, unconscious, to the Schuylkill Medical Center in Pottsville, Pa., suffering from diabetic shock, with a dangerously high blood sugar level of 779. After just two days of treatment in the hospital’s ICU, on April 1, Abu-Jamal was returned to the prison infirmary at SCI Mahanoy in Frackville, Pa., into the hands of the very same doctors whose medical neglect and mistreatment nearly killed him. Prison officials initially denied visits by family members, supporters and Abu-Jamal’s attorneys and only backed down after receiving thousands of calls. Those able to visit Mumia on April 3 reported he was extremely weak, had lost 80 pounds, and still had elevated blood sugar levels over 300. For lunch that day the prison fed him spaghetti, one of the worst foods to give a diabetic patient. The murder of aging political prisoners by denying them inadequate health care has happened before. Earlier this year, MOVE 9 member Phil Africa died under suspicious circumstances at SCI Dallas. The lack of standard medical treatment impacts all prisoners, particularly those over 55. -Allow daily visits by Mumia’s family, friends and attorneys. Their support and protection at this time of vulnerability should not be restricted. -Allow Mumia’s choice of specialist doctors to examine and schedule treatment for him — NOW. Neither the prison staff at SCI Mahanoy nor the Schuylkill Medical Center has a diabetes specialist. There is precedent in Pennsylvania for this. Prisoner John E. du Pont, an heir to the du Pont chemical fortune, was allowed care by private doctors during imprisonment. Mumia deserves the same. -Release Mumia’s medical records to his attorneys. -Release from prison all the elderly age 55 and over. Mumia will turn 61 on April 24. -Allow a full investigation of prison health care in Pennsylvania. -Mumia is innocent and should never have been incarcerated. We demand his immediate release. -Twitter widely using the hashtags #mumiamustlive, #saveMumia and #Blacklivesmatter. – DOC Secretary John Wetzel: 717-728-4109; crpadocsecretary@pa.gov. – Gov. Tom Wolf: 717-787-2500; fax 717-772-8284; governor@pa.gov. – Prison Superintendent John Kerestes: 570-773-2158; contact.doc@pa.gov. -MONDAY, APRIL 6: A car caravan will demand to see Pennsylvania Department of Corrections Superintendent John Wetzel at the DOC office: 1920 Technology Parkway, Mechanicsburg, PA 17050 at 11 a.m. Cars leaving Philadelphia will gather at 7 a.m. on JFK Boulevard between 30th and 31st Streets (across from Bolt and Mega buses). If you can offer rides or need a ride, call or text Joe Piette at 610-931-2615 or email jpiette660@hotmail.com. -TUESDAY, APRIL 7: Press conference in Philadelphia at 11 a.m. outside District Attorney Seth Williams’ office at Juniper Street & South Penn Square (across from City Hall, near Macy’s). -FRIDAY, APRIL 10: Organize a demonstration in your city, on your campus, wherever you can get out word to stop this attempt to murder Mumia. We need to SHUT IT DOWN FOR MUMIA! 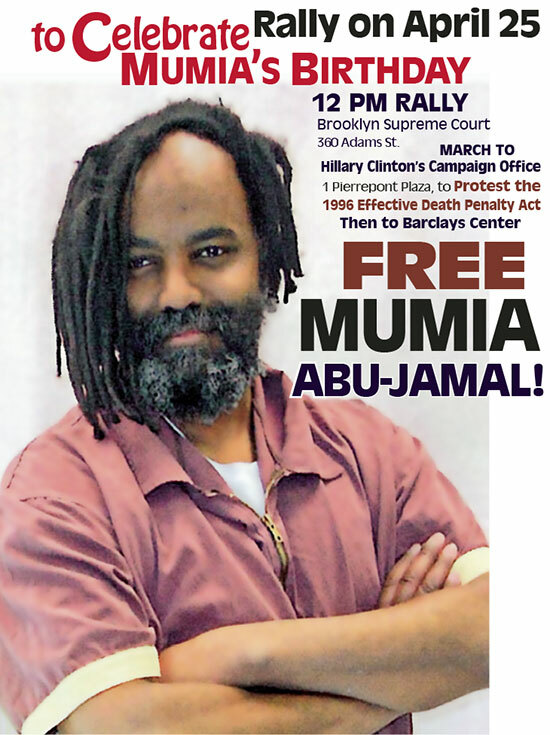 -2) April 3 NYC emergency protest: No medical execution of Mumia Abu-Jamal! With breathless news reports, the U.S. Deptartment of Justice’s Pattern and Practice Study paints a damning picture of a long, cruel and bitter train of maltreatment, mass profiling, police targeting and brutality against Black people in the Missouri town of Ferguson. What may be even worse, however, is how the town’s police, judges and political leaders conspired to loot the community — by fining them into more poverty, fines which today account for some 25 percent of the county’s budget. Correctly, cops have been criticized for their juvenile emails and texts of racism and contempt against the local Black community and even Black leaders in Washington, D.C. There is largely silence, however, over the role of judges, who used their robes to squeeze money from the community, with unfair fines and fees — even using their jails as an illegal kind of debtor’s prison. In 1869, during the reign of England’s Queen Victoria, a statute known as the Debtors Act was passed, which forever abolished imprisonment as punishment for debt. In today’s Missouri, it’s still used to punish and exploit the poor. But, truth be told, it ain’t just Missouri. Famed Rolling Stone writer, Matt Taibbi, in his 2014 book, The Divide, tells a similar tale, but from points all across America — Brooklyn, Bed-Stuy, Gainesville, Georgia, Los Angeles, San Diego and beyond — [where] poor people are being squeezed and squeezed by cops, by judges, by local governments — to part with their last dime — to support a system corrupt to the core. Taibbi’s full title might give us some insight: The Divide: American Injustice in the Age of the Wealth Gap. It’s the system — one of exploitation or predation, ultimately of capitalism. Free Mumia! Save the life of Mumia! Act NOW!